Imbolc falls on February 1st and 2nd in the Northern Hemisphere and it marks the center point for the dark half of the year. What I love about Imbolc is that it is a celebration of hope; a reminder that Spring is just around the corner. This is the time of year when the lambs give birth and the earliest of flowers reach upwards towards the sun. As a whole this sabbat represents ideas like growth, renewal, and purity. This is a time to appreciate the budding fertility of the earth and it is also a time to purify both our spaces and our minds. A great activity to do for Imbolc is to go for a simple walk outdoors and try to notice and subtle hints that spring is on it’s way. Imbolc may also be called St. Brigit’s Day or Candlemas. Brigit is a Celtic fire goddess and is considered a guardian of the home and the hearth. She is also tied to things like healing, midwifery, and smithcraft. When early Christians were unable to stop pagans from worshiping Brigit they decided to make her a Saint and you will often she her referred to as St. Brigit in various sources. The Christian holiday of Candlemas also comes from the reinterpretation of the older pagan traditions celebrated at this time of year. During Candlemas all the candles in the home are to be lit. This ties into celebrations of Brigit who is seen as a guardian of the eternal flame. Here in America, we have the unusual holiday of Groundhogs Day which usually falls on the same day of Imbolc. The unusual superstition of a groundhog predicting the remaining weeks of winter is certainly in alignment with Imbolc divination traditions that used this day look for signs that heralded the hope of spring. You can place items on your altar that you feel relate to this time of year. As Brigit is considered a fire goddess, candles would be an excellent item to place on your altar. You can also use an altar cloth in one of the colors associated with Imboc, which are white, pink, yellow, and green. If you’d like to incorporate stones, the ones connected to Imbolc are amethyst, bloodstone, and garnet. You may also place plant seeds on your altar and ask Brigit to bless them with fertility for the upcoming planting season. More importantly you should think about what in your local environment makes you feel connected to this time of year. As the seasons and weather differs around the world, what you feel connects to this time of year may be different. 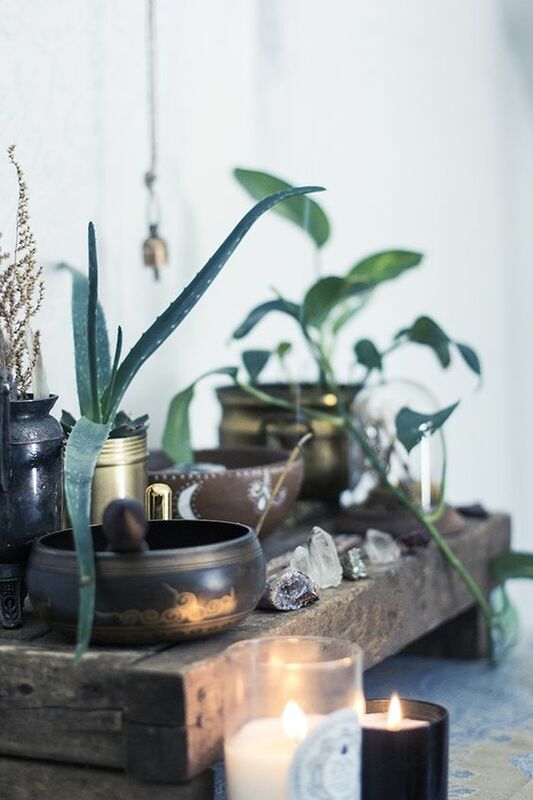 Don’t be afraid to find inspiration from your local environment in items to collect for your altar or for activities that will help you connect with this specific time of year. What are your plans for Imbolc this year? Share in the comments below. 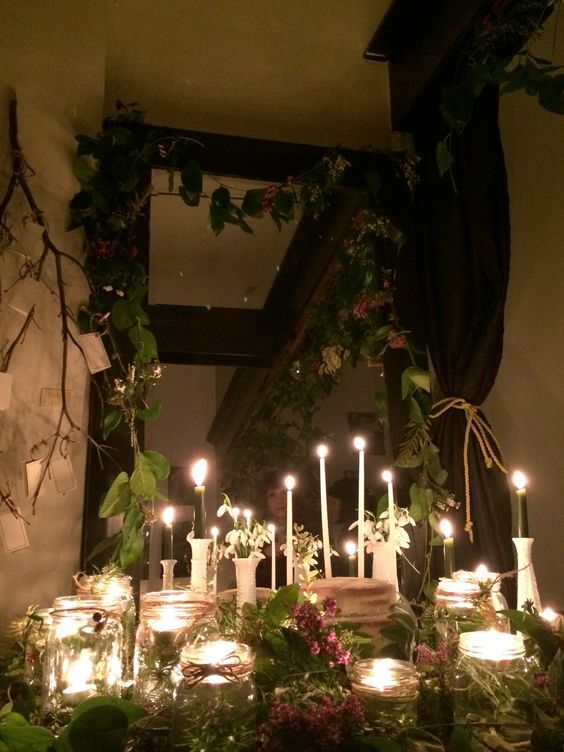 You can watch my video below for more ideas on how to celebrate Imbolc. I came across a video this morning that seemed distinctly Pagan in someway. It’s about a woman who is the caretaker of an old hotel each winter in New England. During that time she is the sole person on the island and she talks about how this isolation has caused her to appreciate the beauty of winter in a profound way. She talks of being inspired by the harshness of the sea, the grey horizon, and the quiet of these cold months. The photography she takes while on the island captures these moments of winter stillness. It reminds me of one of my favorite artists, Andrew Wyeth, who also portrayed the beauty and starkness of winter. During winter I live a life much different from the woman in this video. Living in Chicago I experience daily contrasting vignettes that showcase a distinctly midwestern winter. The smog of chimneys and the roar or the El Train make up a large part of my winter scene. And yet, I still find a beauty in this contrast. When I walk along the lake shore path I can see the monolithic skyscrapers that jut up again the shore. These great titans of human progress still seem small and fragile when up against the roaring icy waves of the lake. Even here in the city I feel myself beholden to the mercy of the winter wind. And for me part of connecting with winter means embracing these feelings of fragility and striving to uncover its inherent beauty. What is winter like where you live? How do you seek out the beauty of these months? Share below in the comments. Upon rising each morning I pull the curtains back from my bedroom window and let the morning light stream into my Chicago apartment. I reach my hands high above my head and try to stretch myself into wakefulness. Once I get up I put the kettle on gather some herbs for my morning tea ritual. This little ritual I perform each morning helps to get me in the right mindset for day. It gives me the time and space to set my intentions and bring in positivity and vitality into my body. I first learned of tea ritual when I was studying abroad in Japan. Soon after I began my classes at Kansai Gaidai University I noticed a humble little tea room towards the back of campus. It was a small structure with sliding doors and a simple brazier in the floor where the tea would be made. Upon realizing that I could sign up to receive a tea ceremony session I immediately did without much understanding of what tea ceremony actually was or what I could expect. When it came time for the ceremony I entered the structure and sat down upon the tatami floor. After several minutes all the other guests had arrived and finally the women who would be performing our ritual entered. Instead of closing the pocket door behind her, she opened it wider to fully expose the scene of nature around us. It was autumn at the time and the hills beyond the campus were a riot of flaming colors as the maples turned to umber and burgundy. The walls and roof of the tea room seemed to create a frame around this natural scene causing the illusion that we were looking at a painting or artwork instead of the nature around us. It became clear to me that all sensory details were meant to be part of the experience: the sounds of the birds outside, the single birch branch carefully arranged in the corner, and the beautiful silk kimono she wore patterned with the vibrant ocher and red hues of autumn. All were meant to evoke both a meditative atmosphere and an appreciation for the present moment. As she began the ceremony the movement of her hands and body were like a dance; each motion deliberate and carefully thought out to maximize beauty and sensation. When I received my cup of tea and took my first sip the warmth spread through my body and seemed to flow all the way to my toes. I was filled with a sense of gratitude. Gratitude for the woman that made the tea, gratitude for this beautiful moment in time, and gratitude to the nearby tea fields that provided the nourishing drink that flowed through my body. Paul Coelho, author of The Alchemist, wrote “Tea Ceremony is a way of worshipping the beautiful and the simple. All one’s efforts are concentrated on trying to achieve perfection through the imperfect gestures of daily life. It’s beauty consists in the respect with which it performed. If a mere cup of tea can bring us closer to God, we should watch out for all the other dozen opportunities that each ordinary day offers.” I can see so many parallels between tea ceremony and many of the witchcraft practices I perform for I too create connection with the God, Goddess and other spirits through my own ritual practices. In my own witchcraft practice I aim to notice the spiritual throughout my daily life with the understanding that even the simplest task, such as making tea, is an opportunity to connect with the divine. Of course with our own busy schedules it is not realistic for us to regularly participate in an elaborate tea ceremony. My solution is the distill the essence of tea ceremony into a simple ritual you can perform each morning before you start your day. I’ve also adapted components of the ritual to fit in more succinctly with my own witchcraft practice. In my version I still use the time to focus on mindfulness and gratitude. However, the components of my ‘tea’ are also of great importance as I use herbs that I’ve either grown or foraged. In this way, I am able to literally drink in the inherent power of my local environment. You can choose to either use fresh herbs or to dry them for later use. If using fresh herbs tear or crush the leaves to release the essential oils. Keep in mind that fresh herbs may take longer to infuse into the water than dried herbs. If using dried herbs first crush them using a mortar and pestle and use one tablespoon of crushed herbs for every 2 cups of water. Bring your water to a boil, add your ingredients, and simmer for about 5 minutes before straining out the herbs. As I make my tea I work to clear my mind and begin to think about what I would like to accomplish for that day. I usually decide on a particular intention or goal. I then add honey to my cup and as it drips I move my hand in an invoking pentagram and state what I would like to bring towards me. I drink my tea slowly and try to be present in the moment. I think about how the herbs taste and envision the power of the earth as a light that flows into my body with each sip. As the warmth of the teacup travels through my hands I smile with gratitude that I have been given this moment in time to connect with and appreciate the beauty our natural realm. Do you participate in any daily morning rituals? Share yours in the comments below. Chicago is swimming in Arctic air at the moment. I cover up in scarves, hats, and mittens yet still the bracing cold seems to find a way to chatter my teeth and send shivers down my spine. I’m currently seeking refuge in the warmth of a local cafe as I write this. I choose a seat furthest from the frosty windows and quickly order a steaming mug of hot coffee with hope that my hair will soon defrost from the winter’s chill. The holiday season is now officially over and for us cold-weather dwellers that means looking towards more months of snow and frost. Luckily, we can find ways to supersede seasonal depression by using the time ahead for a life reboot. So as I look ahead to the upcoming year, here are some things that I will be working on to improve my Pagan practice. A couple weeks ago I was adding some Yule touches to my altar and discovered that a few of my statues had not been dusted in a while and there was incense ash in various places on my altar cloth. I’ll admit that cleaning is not my favorite task. I know that I should be taking better care of my sacred objects so this year I’m aiming to make sure I clean all my altar tools and objects monthly. In addition, I will strive to update my altar more often so that it more accurately reflects the seasonal changes. Yes, this means even when it’s February and the thermostat reads -1 degree. There’s a Scandinavian saying that roughly translates to ‘there is no such thing as bad weather; there is merely the possibility of not being dressed appropriately.’ So this year I aim to be ready for any type of weather so that I can make connecting with nature a part of my daily routine. Along with going for walks I would like to incorporate more seasonally appropriate vegetables and fruits in my diet as a way to further connect with our natural world. In this way I will be celebrating the Wheel of the Year not just through my Sabbat rituals but during each meal. Being a solitary pagan can be lonely sometimes, especially around the sabbats. While there are occasional pagan events and rituals in my area, they always seem too far away or I’m too busy to make it. Though honestly, I could make more of an effort. So this year I will strive to make room in my schedule to attend Pagan events in my local area and hopefully make some more Pagan friends. Along with working to connect with my local Pagan groups I would like to meet others in the wider pagan community. While I have attended Chicago Pagan Pride before I would like to travel this year to one of the larger pagan festivals or conventions in America. Message in the comments below if you would like to recommend a specific pagan convention or festival. As a full time tarot reader most of my day consists of giving readings and continuing to build my knowledge of the cards. This year I would like to expand my divination experience and learn more about the runes. While I’ve already begun my education on runes, their meanings, and various Norse myths, this year I would like to further expand my knowledge. Do you have a favorite book about runes? Let me know in the comments below and I’ll be sure to add it to my reading list. What are your Pagan New Year’s Resolutions? List yours in the comments below. My cappuccino came in an emerald green mug, with a delicate sugar cookie balanced upon its saucer. I took a sip then several deep breaths. In and out, quietly meditating in the cafe while I waited for my client to arrive. I had chosen a quiet nook in the corner by the window. We would be far enough away from the other patrons so that our conversation would not be overheard by others. When my client arrived we hugged and chatted a while over our coffees. He was one of my regular clients and I had been seeing him every other Tuesday morning for several months now. I now knew about his life, his family, his struggles, and his hopes. He trusted me and in return I pledged to keep his secrets and help guide him towards his goals in life. The life of a tarot reader is anything but boring. Yet, in the wider world, I occasionally lie about what I do. Why do I do this? Am I ashamed? I don’t think so. Instead I think that perhaps explaining why tarot is important every time someone asked “what do you do for a living?” would just take too long. Not exactly the best frame of mind I admit, so here it is - my defense of tarot and why it matters in our modern world. The first thing you reach for upon opening your eyes in not the warm embrace of a loved one, but instead the glowing screen of your phone. Daily we poke, swipe, and drag our fingers across these screens. A death by a thousand emails. We are strangled by alerts, notifications, and badges. The truth is that we’re filming life, not living it. And yes, we need to admit that in many ways our phones and the internet has improved our lives, but I ask you to not give up on the simple human connection of a conversation. Our technology often saves us from awkward real-life moments; a softly glowing comfort blanket we carry everywhere we go. Yet, how does avoiding the difficult conversations help us grow and develop as people. Instead of retreating into our individual worlds we need to talk to each other. And not just small talk, we need to discuss our dreams, our desires, and our fears. Sometimes it’s easier to talk about these things with a trusted stranger, someone that can give you an unbiased view. That’s where I, and other readers come in. A tarot reader functions in part like a psychiatrist. We listen to our clients and help them through the difficult parts of their lives. Saying your fears and hopes out loud is a deeply cathartic experience. Having a deep conversation for a full hour with someone is not something we often get the chance to do in our day to day lives. It’s something we need to do more. It reminds us that we’re human in what often can feel like a cold and sterile world. Now that you’ve expressed your true desires, it’s time to figure out a way to achieve them. And that’s really where the fun begins. Why do we admire Alexander the Great? I think it’s mostly because he was a master at battle strategy. If you review the specifics of his battle tactics, you discover how he carefully thought out every move. He played a chess game in his head, maticulously calculating each and every outcome. He knew his enemy, he knew the land he fought upon, and he studied the history of past battles so he knew what would and would not work for each scenario. This ability to strategize key aspects of your life is common among leaders throughout history. Yet, when it comes to our own lives we often tend to ‘wing it.’ Tarot at its core is a tool to use for planning out your own strategy for success. While tarot can often show us what events might occur in the future, it can also create a roadmap to lead us to our goals. It can motivate us to improve our lives and inspire us to think bigger. Tarot allows you to see your own life from a different perspective. We can look from above onto a table of cards that represent us and where we're going. Combining this different perspective with the knowledge inherent in the cards helps us direct our path towards success. I often give readings for ‘tarot skeptics’ - people who don’t believe that tarot connects to anything beyond their face value. I always tell them that even if you don’t believe you still can gain benefit from the aspects I mentioned above. I myself was a skeptic when I started reading the cards. “How could some pieces of card stock with images tell me about my inner thoughts or my future?” I thought. Though as I continued to work with the cards, I slowly started to believe that they connected to something greater. Whether that’s our own subconscious, our collective unconscious, or divinity I’m not sure. All I do know is that tarot helps me tap into something that is greater than myself and the experience is extremely humbling. Through tarot I can help people uncover their own innate intuition to help them see this greater power for themselves. I can help them heal from past difficulties and lay a foundation for the future. Most importantly I can help people realize not only what their true purpose is in this life, but also how to achieve it. This is why I dedicated my life to tarot. Tarot has changed my life in countless ways and has helped me find my path, one step at a time. This is why tarot is worth defending; this is why being a tarot reader is something I am proud of. How has tarot changed your life? What benefits have you gained from working with tarot? Share your thoughts in the comments below. The Dark Days Tarot is one more chapter in the attempt to define what it means to be a modern witch. It’s an idea us who live in the internet age have been thinking a lot about. This deck created Wren McMurdo is distinctly feminine and minimalist. The creator went with a bold choice making the cards square and only using black and white. The absence of bright color forces you to notice the subtleties of the designs. The drawings are quirky, whimsical, and almost surrealist with abundant nature symbolism interwoven and mixed in with scenes of domesticity. The cards that stuck with me the most were the ones that featured a coven working together. Sometimes I dreamed myself into the scene depicted in the Six of Pentacles. As a solitary practitioner, I occasionally go through bouts of loneliness-especially around the sabbats. As much as I enjoy being solitary, I often desire for a community of like minded witches to gather with. To plan a Yuletide meal and invite friends over for rituals. Is there a coven out there for me? I sometimes ask myself. This deck created visions of that world and community I desire. The minimalistic aspect of this deck will not be for everyone. I, however, found the black and white cards beautiful in their simplicity. The fact that they are square also helps differentiate The Dark Days Tarot from the multitudes of other decks out there. The minimalist nature of this deck is part of a wider trend I see among not just deck creators, but our current society at the moment. A growing desire to turn away from all that noise and visual excess and instead focus on something more simple. Something more meaningful. What are your thoughts on these more minimalist decks? Do you like this trend? Share your thoughts in the comments below. The first thing you notice when you drive into Savannah is the trees. The branches reach far over the roads creating a thick canopy of green that shades the road from the blazing Georgia sun. Spanish moss trickles down in a delicate lace that adds a sense of sophisticated decay to the atmosphere. As the wheels bump along the cobblestones below you begin to slow down and get the sense that rushing for anything down here is strongly discouraged. Indeed, this is a city that runs on it’s own sense of time. It is a clock built around mimosas at noon, leisurely walks among the verdant squares, and evening carriage rides. I could not envision a place more diametrically opposed to our rat-race style of living than Savannah. I had been wanting to visit Savannah for a while and I was pleased to see that the city looked just like I thought it would be. This "city in a garden" truly looks like a place that time forgot. The homes that line the grids of public squares are heavy with history. To be in Savannah is to be surrounded by visions of the antebellum south. I began my trip with a visit to the Davenport house, a beautiful home from the early 1800s. As I toured the home I was struck by the french patterned wallpaper that draped the rooms in a vision of luxury. Of course, I knew that this wealth came with a dark reality we must acknowledge - that all this financial success in the antebellum south came from the work of enslaved people. This dark history permeates every aspect of the historic south and must be understood and recognized. The Davenport house was well known to have it’s fair share of ghosts and as I toured the home I could almost hear uncanny piano chords floating in the air. The sound seemed to linger in my ears for several stanzas then delicately seeped beneath the wood and disappeared. Moving into the study a large black and white art print hung dramatically on the wall. It depicted a scene we all know well--the signing of the Declaration of Independence. The tour guide told me that in the antebellum south almost everyone had a copy of this image displayed prominently in their home. He said back then people understood the fragility of their new country so they felt the need to declare allegiance to this great experiment in state- building we call America. For some reason that idea stuck with me. America seems so powerful and impenetrable now. But yes, at one time, we were small and delicate. A nation built upon radical ideas of democracy and religious freedom. At that time the future of America must have seemed like a blank chalkboard: full of possibilities, but also with the risk that everything could quickly be erased. The other event that market my stay in Savannah was a nighttime ghost tour. The coming of night cast a blanket of silence around the city. Savannah is mostly free of the type of rambunctious tourist noise you would find in New Orleans. When you walk the streets at night you feel the quiet in your bones and in the hairs standing upright on your neck. You feel alone among the brick facades as you walk the cobblestone streets. Any rustle of noise causes your head to snap towards the source of sound as you stretch your eyes to find the culprit. I passed through the Colonial Park Cemetery on my way to the tour. The tall grasses seemed to quiver between the gravestones and shadows hung heavy beneath the spanish moss. “I’m sure I'll be fine”, I said to myself as I walked along a pathway lit only by the yellow moon glowing above. ‘Were ghostly phantoms passing behind me?’ I wondered. Did they float swamp-like among the trees? I resisted turning my head around, fearing that I might see something from beyond the veil. As I finally made it to Reynolds Square, I breathed a sigh of relief that I would soon be among other travelers for the tour. Shortly after the tour began we came across a particular house that was lit from the flickering flame of a single gas-lit lantern. It was a very unassuming home set back from the sidewalk and behind a garden of tall grass. With first glance at this home I felt something different. Do you believe that magic can be in the air? That it can follow along the air currents till it finds a receptive host. What I will say is that the air near this small home had a particular taste. It filled my nose with an unusual electric and heavy scent. The tour guide told us this small home was called ‘Laura’s House’ named after a slave who once lived here when she took care of the mansion next door. According to the story, her master once promised her freedom and that he would give her the deed for the small carriage house he let her stay in. However, he reneged on his vow and she remained a slave till her death. It seems she has claimed the carriage house in death and passers by often claim to see her sitting on the rocking chair of her small porch. If there was a shade of paint that could be considered notorious, it would be the color known as ‘haint’ blue. It is thought that this color prevents ghosts and evil spirits from entering the premises so people today still cover sections of their home in this color. The homes next to The Laura House covered their doors, window frames, and porches this color to prevent her from coming in. Even the Laura House has this blue shade around the porch, but not the door. The door was left empty of color so that the ghost of Laura might someday find a way out. The Laura House is now an airbnb so you can even spend the night there if you wish. Though I wouldn't recommend it if you’re male. It is said that men who stay there are often awoken with a sensation of hands clasped tightly around their throat, constricting their ability to breathe. It seems that Laura doesn’t like men too much, and given her life story I don’t blame her. You must be wondering if I actually saw a ghost during my trip to Savannah? I must be honest and say no. I did, however, feel their presence. I felt it rattle my bones as I walked along the cemetery. I felt the electricity in the air as I stared into the Laura House. A question I often ask myself is if these feelings are truly real. Or, does just being in a place filled with old homes and ghost stories cause us to have these sensations. I guess I’ll never really know for sure. But if ghosts are real and they are out there, I’m confident that many of them call Savannah their home. Have you ever been to Savannah? Did you get the sense that the city was haunted? Share below in the comments. A gathering approaches. I’m in the heart of my home tending to a bubbling brew atop the stove. Cozy knitted socks warm my feet against the October chill and the steam from the pot of wine tickles my nose with the scents of late fall. Warm clove and cardamom meld with the bright citrus of orange peels. Five-pointed anise stars and thick cinnamon sticks bubble to the top of my burgundy brew. I swirl the collection of herbs around with a wooden spoon and my cat jumps up onto the kitchen counter, trying to get a better view. The doorbell chimes. My fellow witches have arrived! I let them in and we share our tales of magic and mischief as I carefully pour the mulled wine. The steam spirals above the mugs and twirls towards the window. I catch a glimpse of the trees outside. The crackled brown leaves of late October are frosted with ice crystals, yet they still dance as the wild wind whispers through the branches. We move to the living room and get cozy by the crackling fireplace. Cheers! 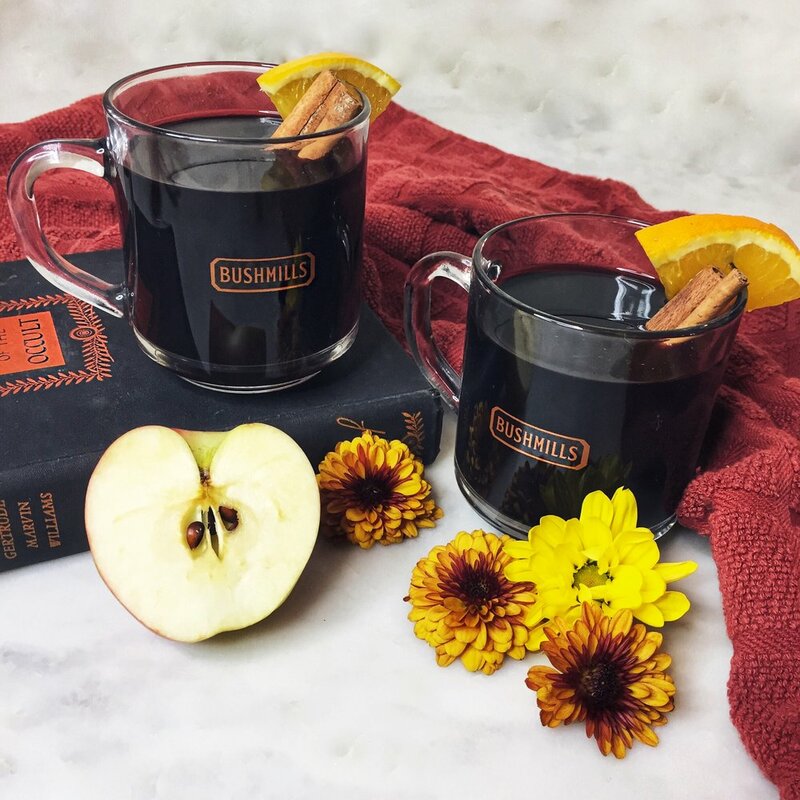 We chime our haphazard collection of glasses and mugs together and begin to warm our bellies and hearts with our autumnal witches brew. Take a large pot and add the wine, cider, cinnamon sticks, cloves, star anise, honey, and orange zest & juice. Bring to boil then simmer over low for around 10 minutes. Pour into mugs and add an orange peel as a garnish. Enjoy! A lightning strike then a loud crash. The tower comes tumbling down and we are thrown from on high to crash-land below, beaten and broken. The only way to face a ‘tower card’ moment is to stand up, brush the dirt off your knees, and begin to build again. In a time like that, when all seems lost, you look to the distance and see a small shining light. Subtle at first, but growing lighter by the day as you pass through a long tunnel. And then as you reach the end of tunnel, there she is - hope. There are certain moments in your tarot study when you become taken aback by the sheer wonder of it all. How the cards not only bring us truth, but do so poetically. In tarot, the Star card comes right after the destructive force of the Tower card. At a time we need it most. The Star card shows a beautiful maiden at the edge of a lake. She is pouring two cups of water - one into the great healing lake, and another onto the sand. Glittering stars illuminate our lady as she dips one foot carefully into the waters of our subconscious and places the other firmly on land. She is of course the Water Bearer, a personification of Aquarius. I used to be baffled when I first learned that Aquarius is in fact an Air sign. I thought as a ‘water bearer’ it made much more cosmological sense for Aquarius to be grouped in with the other water signs. But when I meditated on the Star card it began to make sense to me. The star card is about hope, renewal, and inspiration. These are ideas and constructs that we form in our mind, and our mind is ruled by the element Air. Yet, water is ever present in the Star card. Water as a symbol is usually connected to healing and the subconscious. It is the combination of both the healing power of water and our mind’s capacity for hope that brings us to a state of true healing. This is what the Star card represents to me. When this card appears in a reading it foretells a time of calming energy and mental stability. These things are necessary after facing any kind of drastic upheaval or change. The Star card gives us permission to forgive both others and ourselves so that we can move on to the next stage of our life. I like to mediate with this card whenever I’m facing a difficult time within my life. I visualize myself next to the lake featured in the card. I imagine my toes caressing the smooth sand at the water’s edge. Dipping my hands into the healing water, a bright light forms in the ripples and travels up through my body bringing me into a state of calm. I then go in search of the beautiful maiden. Finding her off in the distance beneath a tree, I ask her how I might best move on from my difficulties and bring balance again into my life. In my experience, when I do this visualization and meet the water bearer, she usually gives me good advice. Of course, I believe that it is really just my own subconscious that is coming forth and proving the answers I need to grow. Just as the maiden dips her toe into the water of our subconscious realm, we do the same when we participate in tarot readings or meditations. The healing guidance we need is always there, within ourselves, and tarot is a tool that helps us discover it. Do you use tarot to help you get through difficult times? Share your experiences with the healing power of tarot in the comments below. While I associate the Star card with healing, is there a different card that you like to use for healing spells, meditations, or tarot sessions?